The NRA-backed proposal was opposed in committee but was revived Thursday on a quick vote with no debate or roll call. AUGUSTA — The Maine Senate quickly and quietly passed a bill Thursday that would prohibit most private landlords who accept public housing vouchers from barring tenants from keeping guns in their apartments. The bill, backed by the National Rifle Association, was inspired by an incident last year in which a Rockland man shot an intruder in his apartment but was later told by the property management company that he had to relinquish his gun if he wanted to keep living there. The Criminal Justice and Public Safety Committee had voted 8-4 against the bill, after concerns were raised by property owners about the impact on their rights and ability to set rules for their tenants. But those concerns didn’t surface and there was no debate when the bill came up for a preliminary Senate vote Thursday. Lawmakers approved the bill without a roll call vote or any discussion, underscoring both the influence of the NRA in the Legislature and the fear that opposing the organization could be a liability in the November election. Opponents of the bill now hope it will be killed in the House of Representatives, which is controlled by Democrats. However, defeating the only significant gun-related proposal of the legislative session – in an election year – may prove difficult. Lawmakers, particularly those in rural swing districts, are often reluctant to be seen as voting for bills that can be perceived as restricting the Second Amendment right to bear arms. Rep. Lori Fowle, D-Vassalboro, co-chairwoman of the Criminal Justice and Public Safety Committee, said proponents of the bill, L.D. 1572, had convinced two committee members who originally opposed it to change their positions. One of them, Sen. Stan Gerzofsky, D-Brunswick, is a termed-out legislator with a long history of opposing NRA-sponsored bills. The proposal approved in the Senate had been amended, but Gerzofsky acknowledged that the bill’s original intent was largely intact. Asked why he changed his position, Gerzofsky said he reviewed all of the testimony and believed that people receiving housing assistance shouldn’t be denied the right to keep a firearm in their home. “Just because you’re poor doesn’t mean you don’t have the right to defend yourself,” said Gerzofsky, echoing statements made by the bill’s supporters, including its sponsor, Sen. Andre Cushing, the assistant Republican leader from Hampden. Gerzofsky also acknowledged there had been a political calculation. “It’s a gun bill. This is a campaign issue,” he said, declining to elaborate. Fowle, who opposes the bill, said the upcoming legislative election could make it difficult for opponents to defeat it. “They’re making this a gun bill, and in this building we all know how those usually end up,” she said, referring to the Legislature’s history of rejecting gun control bills and accepting legislation that affirms or strengthens gun rights. Fowle rejected arguments that the bill is a gun rights issue. She said the measure is about the rights of private property owners to determine what can take place in their rental units. “It’s a big government reach to tell private landowners what they can put in their rental agreements,” she said. The bill is part of a national NRA campaign on behalf of gun owners who live in public housing. In Maine, the organization won a significant public housing case in 1995, when the state’s highest court unanimously struck down a two-decade ban on guns in Portland Housing Authority projects. The bill would take that victory further by determining whether private property owners who receive public subsidies, such as federal Section 8 housing vouchers, can prevent their tenants from possessing guns on the property. The organization’s legislative action arm has used email alerts to mobilize its members to support the bill. Owner-occupied rental housing of four or fewer units are exempted from the bill, meaning those landlords could restrict firearms from being kept on their property. In recent years, lawmakers have repeatedly rejected strengthening background checks, while passing laws that allow concealed-handgun owners to carry without a permit, and shielding the names and addresses of those who hold concealed-weapon permits. In 2012, lawmakers went against business interests and private property advocates in passing a bill that allows employees to keep guns in their vehicles at work. 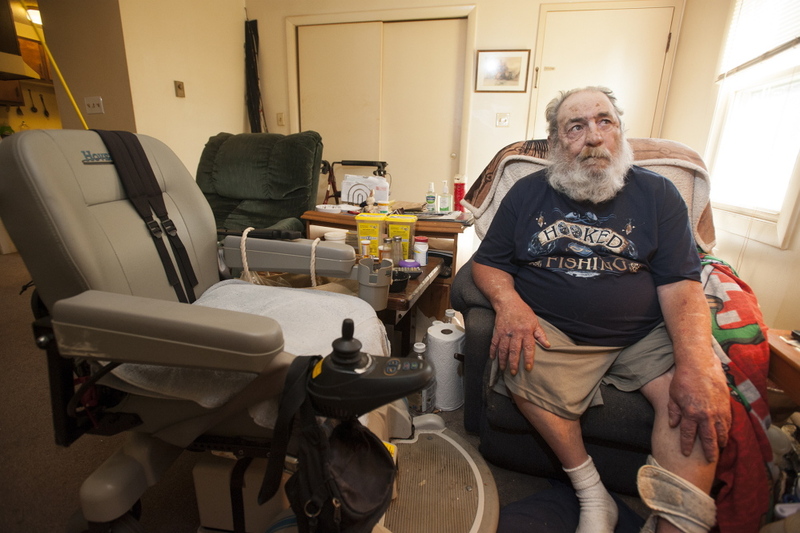 Harvey Lembo, the retired lobsterman from Rockland whose skirmish with an intruder prompted the legislation, has sued his landlord, Stanford Management Co. of Portland, in federal court. The case has drawn legal support from the NRA, as well as criticism from a gun control group, the Maine Gun Safety Coalition. The coalition argues that a ruling against Stanford Management Co., which manages 1,500 properties across the state, would have longstanding implications for private property rights. Court action on the case is pending.